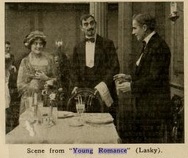 One of the notices for this film in Moving Picture World stated that it “forever silences the claim that refined comedy cannot be conveyed via the screen.” There’s some truth in that claim, for this is certainly not a slapstick comedy, but it has elements that hearken back to “How a French Nobleman Got a Wife” (as well as its predecessor, “Personal”), and at the same time seems to prefigure the kind of situational comedy that made Clara Bow famous in the twenties. Bow would have been right at home playing our protagonist, a spunky romantic shopgirl who decides to save her money in order to masquerade as a well-to-do customer at a seaside resort in Maine, in the hopes of snagging a handsome and wealthy husband. Clara was still only nine years old when this made, though, so instead we get Edith Taliaferro, a stage actress who only made three movies (this being the only one that survives). She handles the transition to silent film well, neither over-acting nor under-acting, but she lacks Bow’s infectious vivacity. Her scheme works well, attracting not one, but two paramours, but, as silent film fans might predict, both of them are just as much imposters as she is. The nice one (Tom Forman, who appeared in the similar “A Gentleman of Leisure” that same year and later in “The Sea Wolf”) just happens to work in the hardware department of the same department store she does. The bad one is a phony count (Al Ernest Garcia, who later did quite a bit of work with Chaplin, including “City Lights” and “Modern Times”) who takes a cheap hotel room fortuitously close to the young hero. This permits him to eavesdrop and foil the plans of the Count when he plots to kidnap the phony young “heiress” in order to extort money from her. 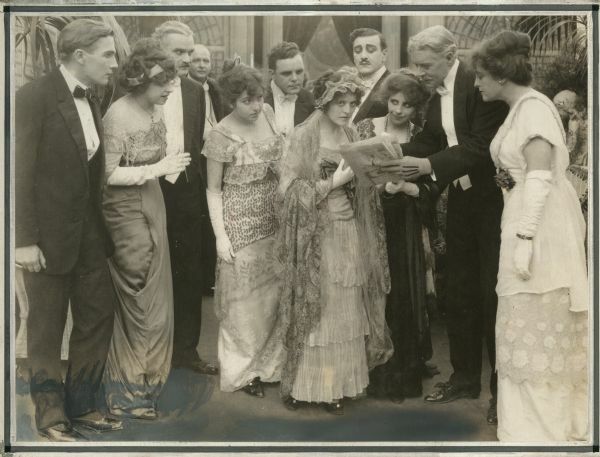 Visually, I found this movie quite good for early 1915. Much of the movie is shot on location, presumably at a Long Island beach resort, and shots of the beach are at times spectacular. The shots often have a greater depth-of-field than others movies of the time, and even when they are limited to small “stages,” the sets are decorated in a very conscious, balanced fashion, presenting a stylish mise-en-scène, appropriate to the sophisticated storyline. The editing emphasizes contrasts and parallels. We see Edith and Tom prepare for their trips in similar tiny apartments, then arrive and move into strongly contrasting hotel rooms – his dismal and small, hers spacious and lovely. Other pieces of editing, such as the Count’s getaway on a train being intercut with Tom’s boat ride to the rescue also show good use of parallelism. We also get close ups, irises, and an interesting overhead pov shot when Tom peers through a hole in his wall to observe the Count’s nefarious actions. There are minimal special effects, but towards the end of the movie, as the two lovers realize that they must own up to their deceits, we get two interesting uses of matte shots to show their thoughts visually. This reminded me of the scene in the restaurant in “Sunrise,” not to be made for many years yet, in which the husband and wife hold each other while their thoughts hover above them. In all, it’s a nice simple comedy that presages some of the trends in later silent film.